We checked out the Buffalo Peregrine nest sites today. BB and Smoky were at home on MacKay Tower, BB on the perch and her mate on the other side. Around lunchtime, the Central Tower was unoccupied but later in the afternoon, one pefa was seen on a high corner before it flew off to the east. 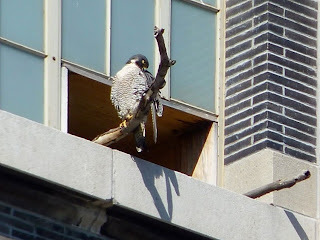 Statler mama was also perched at the box this afternoon. Mating should be occurring any time now! ~BB's First Egg for 2010! ~Great news! BB & Smoky have cam!! !